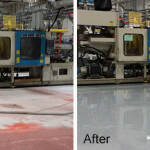 Floor coating removal gets rid of damaged epoxy flooring and other industrial floor coatings to make room for new and improved industrial floors. 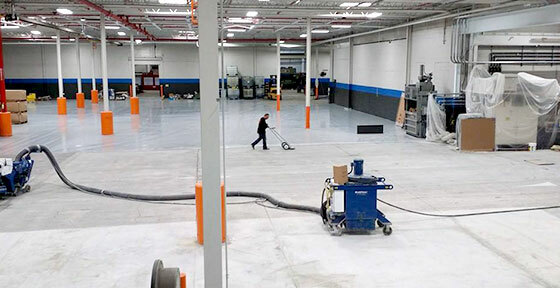 With the use of efficient concrete grinding tools, the industrial flooring experts at North American Coating Solutions will remove your floor coatings without damaging the concrete beneath them. Trust in our floor repair solutions to then restore your floors back to their former glory. Improve your old, worn industrial floors today. Our floor coating removal services are designed to remove the surface layer of your floor coating without wearing away at the concrete below. We use tested and proven grinding methods to smooth the surface of your floors and make room for fresh coating. Our safe industrial flooring removal works over damaged concrete floors without making your existing issues worse. If you have damaged floors in need of repairs, our concrete restoration experts will gladly fix your flooring for you. Learn more about our floor coating removal services by contacting North American Coating Solutions today at (586) 226-9416. In some cases, floor coating removal is an unnecessary step in the flooring restoration process. We work with the best industrial floor coatings on the market, and many of them can be applied directly over your existing floors. Before you invest in floor coating removal, talk to our flooring installers about your options. If there is a more cost-effective and time efficient option out there for you, we will explain it to you. With our family owned business, customer satisfaction is our top priority. We will never charge you for a service you do not need when there is a better solution out there. Call us today for a free quote to see if floor coating removal is right for you. If floor coating removal is not a good fit for your business, you could invest in new epoxy floors that apply right over your existing coating. Our highly durable epoxy floor coatings are designed to bond with nearly any flooring surface on the market. They are self-leveling and smooth to the touch, so your damaged floor coatings will not show through. Change the color, texture, and sheen of your flooring without extensive removal services and get the look you’ve been searching for. Contact North American Coating Solutions at (586) 226-9416 today for more information.